The chain of islands that makes up Hawaii was caused by a hot spot, an area where hot magma rose, broke through Earth’s crust, and formed volcanoes, at first below the ocean surface. Exposed rock cooled under water, forming seamounts, or underwater mountains. As volcanism continued, the seamounts emerged from the water and continued rising, forming islands. Volcanic islands like Kauai are different in many ways from the volcanoes that occur at tectonic plate boundaries in the Earth’s crust. In this activity, you will explore how volcanism has shaped the ecosystem of Kauai — and how volcanism varies across the country. Discuss what you know about the geology of Hawaii. What would you expect to find in the types of rocks, landforms, and plants common there? Record your thoughts in your notebook — and continue recording your answers to questions among the following steps. Visit the Esri Ecological Tapestry of the World map here: http://ecoexplorer.arcgis.com/eco/. In the search box, search for 'Kauai, Hawaii'. Zoom in on the northernmost Hawaiian island. Compare the western portion of the island (left) with the eastern part (right). What patterns do you notice? What is similar? What is different? Double-click on any portion of the island. Notice the four maps that pop up in a window on the right of the screen. These four smaller maps show the Bioclimate, Landforms, Rock Type, and Land Cover of the area. Expand the Landform Map by clicking on the plus sign in the map section. Use the key drop-down to understand what the different colors represent. Where do you see high mountains and deep canyons? Where does the land appear comparatively flat? How might factors such as lava flow or erosion, occurring over thousands of years, have produced these patterns and variations in terrain? In fact, geoscientists have determined that the relative flatness of the eastern part of Kauai is due to a massive landslide that took place some 5 million years ago. Knowing this, expand the Rock Type Map. Because Kauai is a volcanic island, the geology is all volcanic rock. However, differences in color in the map show that the volcanic rock in some areas is older than in others. Why do you think this is? How might factors such as volcanism, lava flows, and erosion account for where new rock has been formed or old rock has been exposed? Lastly, expand at the Land Cover Map. The term land cover refers to the physical material covering the land, generally plant life. Again, compare the eastern and western portions of the island. 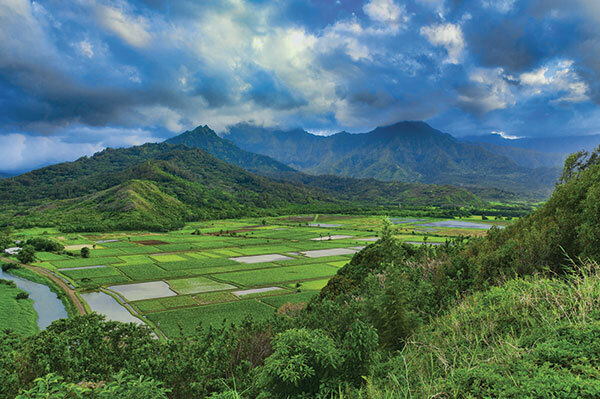 How might differences in landforms and rock types — which affect the paths of rivers and the fertility of soils — be related to the dispersal of Kauai’s vegetation? In the Map drop-down box, click Ocean. On the map, click and drag your mouse to move northward to Alaska. The islands of both Hawaii and Alaska are made of volcanic rock. However, notice the dark blue line in the ocean just south of Alaska’s Aleutian Islands. This line represents a plate boundary. The Aleutian Islands formed not by a hot spot, but by a collision of tectonic plates. Use this online tool to explore the landforms, rock types, and land cover of these islands. How do they differ from those of Kauai? Find your location on this map. What do you notice about your area from the satellite image? What are the major landforms in your area? What is the dominant rock type? What is the most common land cover? How do you think these factors have shaped human activity over time in your area? Do these visualizations represent the ecological history of your area? For more adventures using this map, visit Esri's storymap: Explore a Tapestry of World Ecosystems. This ecosystem tour will take you around the world (and to Kauai, Hawaii) to show different examples of how Earth systems interact and form diverse ecosystems. Investigate geologic mapping in your state by going online to http://www.stategeologists.org/. Click on your state, which will send you to your state’s geologic survey website. Find your state’s local geologic map. Study the map’s geologic patterns and the key and note what features are identified. Are there faults? Folds? Rivers? Valleys? Other features?